I messed up big time and I need help. Next time something like that happens, you can also try trading / WonderTrading from where you are using your PokeGear! Hey guys! I know I keep asking for help, but this one's got me particularly stumped. Noel's Clefable -- heck, even his Cinccino -- are quite frustrating. The Pokemon I am most likely to train / have trained are in my signature. Not listed, however, is a Fire/Flying Oricorio that could prove useful if anyone has any tips? Usually, I take out Porygon-Z with Higgledy (Musharna). Unless the RNG decides to be annoying and add a status along with Tri-Attack, Higgledy manages to to take Porygon-Z out with two (or, rarely, three) uses of Psychic (boosted by the TwistedSpoon). Next up is usually Swellow. At this point, Higgledy is usually too worn-down to survive anything from Swellow long enough to use Charge Beam (which, even then, has a chance of missing), so I switch into Sligma (Magcargo). Swellow's Flame Orb lets it use a powerful Facade, which still deals a surprisingly large amount of damage even to a Fire/Rock type like Magcargo. I take it out with Ancient Power, which leads to Noel sending out either Bewear or Girafarig. Easy-peasy. I send in Les (Meowstic-M) for a Fake Out + Psychic combo. I send in Linus (Liepard) for Sucker Punch, although I am considering changing this to some other Dark-type move if I can. It usually works, albeit at the cost of a chunk of HP due to Thunderbolt as well as a virtually unavoidable paralysis when Girafarig has a chance to use Thunder Wave. So, at this point, the team is still somewhat strong. However, my team has typings that can be taken out by most of Cinccino's attacks. And in comes Cinccino. I usually end up wearing it down until I'm left with Les, Gilly, and an extremely weakened (and possibly statused) Higgledy. Clefable comes next, and it is not fun. Les uses Fake Out + Psychic (STAB + Metronome + Psychic's simple power??). I once got a crit and almost took it out with Gilly, but, keeping in mind Clefable's possession of Hidden Power Ground and Noel's possession of three Hyper Potions, you can probably guess how that turns out. Higgledy is last to go, and there's not much that can be done at that point. I think you'd get more feedback if you posted this on Team Showcase, but for starters (and from a very novice point of view), musharna and meowstic are both pure psychic types and therefore redundant. I'd keep male meowstic and change his ability to prankster so he can set up light screen / reflect faster than the opponents. First of your signature doesn't show up in status Updates so it's a bit of hassle to go check for one of your posts just to know what you can work with. Anyhow, your Magcargo doesn't have Shell Smash. It really wants Shell Smash, that's the main thing making it viable. I'd recommend Weak armor as Ability too, since that allows it to get an additional boost off a physical hit while setting up. With a Shell Smash boost under its belt Flamethrower should do tns of damage on Noel's field. As long as it's not raining, at least. Male Meowstic isn't a very good attacker, so turn it into a Prankster Support as soon as you can. About Minccino, I'm assuming it's faster than a lot of your Pokémon? If you don't have anything that can take a hit and slow it down (Rock tomb, Bulldoe, paralysis) I'd recommend tanking its Attack stat. Meowstic's Charme and Reflect work for that. I also recommend changing Arcanine's ability to Intimidate. Clefable is a Special-focused tank, so you're best of using physical attackers against it. If you have anything with toxic or toxic Spikes you could also try stalling it out. While Charizard is a very solid Pokémon you already have two Fire Pokémon in your team and I remember you also had a Rapidash some time back, so training yet another Fire type wouldn't yield all that much. Oricorio could be interesting with its various forms allowing it to be rather versatile, although its stats are just a little lower than I'd want them to be in the long run. Some solid Pokémon that recently became available for you are Zubat, Yanma, Skrelp, Trapinch, Archen or Sandile. There's more obviously, but these are all Pokémon I'd definitely vouch for. Flygon and Archeops in particular have great movepools for upcoming parts of the game. Finally, did you pick up the House Key in the Underground Railnet? It unlocks the Move Reminder in Onyx Ward which unlocks a lot of flexibility in your movesets and lets your Pokémon relearn a bunch of Lv.1 moves they'd otherwise only learn way later. You can get more Heart Scales fishing for Luvdisc right by Charlotte's family's house or by mining. Yes, I found the House Key, although I did not know about the Luvdisc thing. I fished out some Heart Scales and changed up my movesets, and I'm also Pickup-farming using the things I fish up that aren't Luvdiscs. Meso (Garbodor) has Toxic Spikes, but he does need some training. Will update once I'm done training everyone up. Renee: Why aren't the dishes in alphabetical order?? Linus: WHAT THE HECK DOES THAT EVEN MEAN?? Mesopotato: Good credit? Bad credit? No credit? No problem! Are you dead? Who cares! GHOST CREDIT! Recon: IMMA GO BUY A SUBARU! Lesbi: You know, Rays can be real aggressive. So it’s important to take all necessary precautions when approaching. Higgledy: How much money you got? BTW, what Mons are on your team? 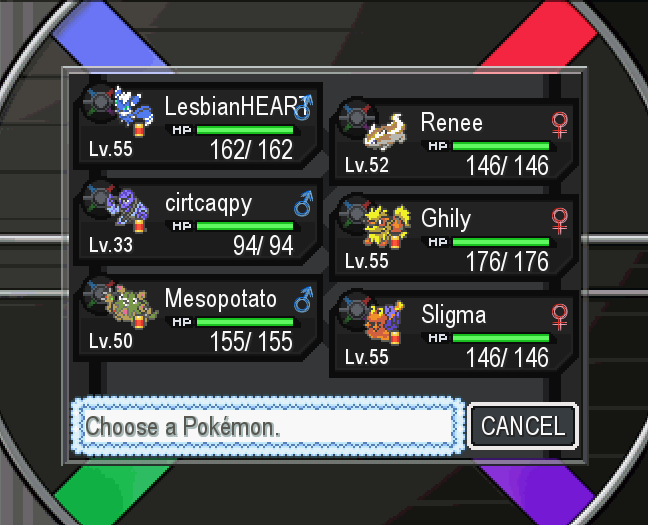 It changes frequently based on the task at hand, but my main team is Meganium, Linoone, Musharna, Rapidash, Garbodor, and Meowstic-M.
Rays: Considers himself superior to all. Literally only listens to Higgledy. Lesbi: Over the course of the run, he has become increasingly more confident as he seeks revenge on Team Meteor. Linus: Considers himself superior to all, but has a grudging respect for Rays and Gilly. I think I've almost perfected my strategy against Doctor Geezer. It's the oddest combo: Destiny Bond Carvahna, super duper Fast so it gets to use DB before Musharna uses Dazzling Gleam, so Musharna is down for the count. Then I switch into Liepard, who uses Shadow Claw until Rotom is down as well. Next up comes Drampa, at which point I use Liepard's Play Rough. She usually faints at this point, so I switch into Meganium, who is holding a Black Belt, so that he can Rock Smash through the remainder of Drampa's HP. Next comes Alolan Raichu; I switch into Rapidash for High Horsepower, which, when boosted by a Ground Gem, OHKOs the Raichu. The problem, then, is the remaining two Pokemon. When I get lucky with the RNG, Charizard can do a bit of damage to Hypno by way of Crunch before it defeats me. Then, I switch into Linoone so I can use Shadow Claw, but, for some reason, Hypno seems to quickly overtake Linoone. Therefore, I switch into my only remaining Pokemon, Rapidash. Rapidash takes way more damage from Hypno than he should by my calculations? But, then again, I've never been that good with damage calc. Anyway, Electivire then finishes off the weakened Rapidash with Thunder Punch. Yeah arcanine sounds hella useful. Extremespeed is useful too in case you need to finish off something like raichu who might outspeed you otherwise. Just make sure his health is low enough haha. Hmm maybe replace linoone with arcanine, i think he might fair a bit better. Hmm...dragon dance on charizard? I feel with 2 or 3 boosts(provided you can pull them off) he might be able to one-shot raichu/musharna/hypno, depending on his nature/IVs, maybe calculate it to see how much it'd deal. Drampa should take some damage from a similarly boosted wing attack, it'll probably two-shot him, thing is drampa can hit kinda hard so I don't know if Grill will be able to last that long. sucker punch is a priority move, but I don't think liepard can KO with it alone even on SE hits. It's good for finishing off wounded psychics though I guess, maybe even Evire if he's hurt enough. I used skuntank for that very purpose but mine had a +nature attack. Linus vs Rotom, Linus uses Shadow Claw, Rotom uses Discharge. Linus down to 41/138, Rotom is in the yellow. Linus vs Rotom, Linus uses Sucker Punch, Rotom faints. Gilly vs Drampa, Gilly uses Close Combat, Drampa uses Calm Mind. Drampa is in the yellow. Gilly vs Drampa, Gilly uses Close Combat, Drampa faints. Grill vs Alolan Raichu, Grill uses Dragon Dance, Alolan Raichu uses Thunderbolt. Grill faints. Linus vs Alolan Raichu, Linus uses Shadow Claw, Alolan Raichu uses Thunderbolt but misses due to Linus' Full Incense. Alolan Raichu is in the yellow. Linus vs Alolan Raichu, Linus uses Sucker Punch, Alolan Raichu faints. Linus vs Hypno, Linus uses Shadow Claw, Hypno uses Dazzling Gleam. Linus faints, Hypno down to approximately 50% HP. Gilly vs Hypno, Gilly uses Retaliate, Hypno uses Psychic. Gilly down to 44/145, Hypno in the red. Gilly vs Hypno, Gilly uses ExtremeSpeed, Hypno uses Psychic. Gilly faints, Hypno remains with a sliver of HP. Rays vs Hypno, Rays uses Strength, Hypno faints. Rays vs Electivire, Rays uses High Horsepower + Ground Gem boost, Electivire uses ThunderPunch. Rays down to 48/132, Electivire in the red. Rays vs Electivire, Rays uses High Horsepower. Electivire faints! FINALLY! CONGRATSSS!!!! Yeah Sigmund is a bit of a pain, glad you were able to finally beat him, Linus and Gilly put in work haha. yo happy birthday m8 i hope u have a fantastic day!! I imagine that my Pokemon in reborn have personalities. I do it with all Pokemon games, really. Sliggy just muscled through three of Doctor Geezer's pokemon. We didn't win this time, but it's nice knows that she is willing to go through all that for the kids' sake. I do the same. Though it is kind of funny when "modest" and "serious" pokemon turn into cocky slackers when they pass the level cap lol. Magcargo muscling through anything is an accomplishment really haha. Me, having defeated all of Serra's Pokemon except her Froslass, down to a single Arcanine with paralysis and 3HP: Okay, Gilly, use ExtremeSpeed! Thanks for the tips, everybody! I trained up my Arcanine, evolved my Charmeleon, and did like 2 minutes worth of training with Golem, then went in with Golem, Magcargo, Charizard, Rapidash, Arcanine, and Linoone. I ended up using 2 Cotton Candies, 6 Full Restores, and a Super Potion, and I made it out with one Pokemon left standing, with 2HP Thanks again y'all! Good bread is absolutely delicious. Bad bread depresses me and can genuinely put a stop to my day. I can't seem to get past Bennett. Usually his Masquerain ends up being my downfall. The Pokemon I have that are at a level that is somewhat compatible with the gym (given a bit of training, of course) are listed in my signature. Nicknames are also listed in the siggy. If you want to know abilities, moves, stats, etc, ask and ill screenshot. My strategy so far is to use Rett (Golem)'s Bulldoze first turn to destroy the mirrors, so any ideas should preferably stem from that. Rett usually ends up sacrificing with Self-Destruct in the rare case that it survives, anyway. After that, I switch into Splin (Spinda) for another sacrifice, this time simply so that Bennett will switch into Venomoth rather than Masquerain. If Splin survives, I will then Teeter Dance the Venomoth and switch into Rays (Rapidash), who takes out Venomoth with 2-3 Bounces. Then comes Masquerain. Rays? Hydro Pump, dead. Renee (Linoone)? Signal Beam, dead. Higgledy (Musharna)? Signal Beam, dead. Lesby (Meowstic-M)? Signal Beam, dead. I've also tried revenge-killing Venomoth using Fred (Pyukumuku)'s Innards Out and Pain Split, but no dice as of yet. Any suggestions? It comes somewhat close to knocking out Illumise? I'll try leveling Growlithe up a bit via the grand hall trainers, and I'm also gonna try to scrape together money to buy potions. This starts strong until Anorith gets on the field. I decided to pair Farfetch'd's Acrobatics with Meowstic's Fake Out on the first turn to not only prevent it from Rain Dancing, but also do a whole lot of damage on the first turn. However, eventually, this starts to weaken; Masquerain follows up with an Icy Wind, which hits Farfetch'd somewhat hard, or a Struggle Bug, which nearly decimates Meowstic. On the same turn as this Icy Wind or Struggle Bug, Shelly uses a Hyper Potion. I would then use Meowstic's Attract in an attempt to immobilize Illumise so it can't use Rain Dance, but usually this is the turn when Meowstic is taken out by an attack from Masquerain. Acrobatics gets rid of one of the bugs, and out comes Anorith. Anorith is a mega sweeper. Anorith starts out with its Telluric Seed, so I can't Attract, Fake Out, etc. first turn. Rock Slide decimates Slugma, Growlithe, Farfetch'd, and Dustox, and whichever bug remains will usually clean up the rest. Another strategy I've come up with involves a Poochyena (it's shiny!) that I found a while back. I'm pretty sure I can use my Embargo TM on Poochyena, train it up, and then I wouldn't have to worry about Shelly's Hyper Potions, Anorith's Telluric Seeds, Illumise's Damp Rock, etc. Thoughts?